Orlando Health Arnold Palmer Hospital for Children was dedicated in 1989 and just over 25 years later, it has earned a reputation as one of the leading hospitals of its kind in the Southeast and the nation. Today,Orlando Health Arnold Palmer is a 158- bed, 362,000 square foot facility that uniquely meets the healthcare needs of children by providing a full spectrum of pediatric specialties and sub-specialties including trauma and emergency care, cardiology and heart surgery, craniomaxillofacial surgery, critical care, gastroenterology, nephrology, neurology, neurosciences, hematology/oncology, hospitalist services, orthopedics and sports medicine, pulmonology, genetics and palliative care, general surgery and community outreach services.Orlando Health Arnold Palmer has recently expanded its transport service with the addition of a third vehicle for the pediatric acute care transport team. A special pedestrian bridge linksOrlando Health Arnold Palmer to Orlando Health Winnie Palmer Hospital for Women & Babies. 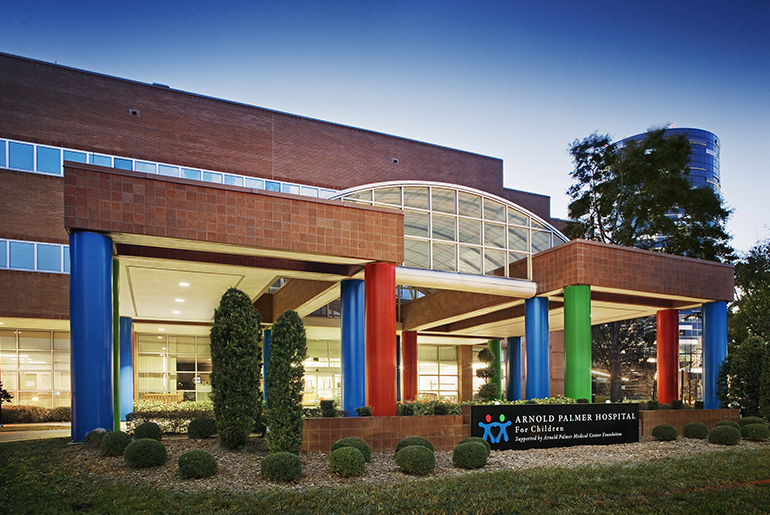 Together, these two hospitals form the Arnold Palmer Medical Center - the largest facility dedicated to children, women and babies in the United States. Learn more about Orlando Health Arnold Palmer at www.arnoldpalmerhospital.com.